Continuous Extrusion Machine | New Delhi ,India from Velocity Engineers Pvt. Ltd.
Exporter of a wide range of products which include PVC Extruder. Cold pressure welding is an economic and effective way to join non-ferrous metals and their alloys without using heat, fillers or fluxes, and it can create a weld as strong as the parent material and has the same electrical characteristics. We have portable style, desk style and hydraulic pressure car style of cold welder. With years of deep industrial experience and knowledge, we are providing an impeccable collection of Upward Continuous Casting Machine. Offered casting machines are fabricated by making use of superior-grade material and with the help of modern machines as per set industrial guidelines & norms. Along with this, we examine each machine on predefined limitations of quality before providing it to patrons. Upward Continuous Casting Machine / Vertical copper casting for copper rod which are used to for production & oxygen-free copper rods & brass rod for the wire and cable industry, with the outstanding properties of high conductivity and good draw ability. It can also be used to produce other copper alloy. With the aid of our crew of professionals, we are providing Wire Tinning Machine which is used to apply a covering of tin on the copper wires. 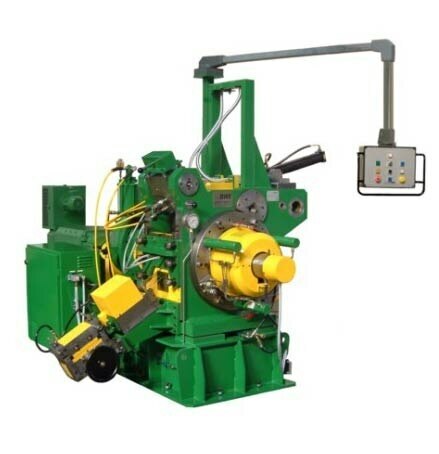 Offered tinning machines are accessible in numerous models and stipulations to pick from. In addition to this, the offered machines can also be purchased by patrons from us at industry-leading rates. This Multi Wire Annealing Machine, Continuous Annealing and Tinning Machine is used for annealing the bare copper wire and hot dip tinning. Our company has received huge appreciation as the affluent providers of an optimal quality assortment of Wire Enameling Machine. The offered copper and aluminum Wire Enameling Machine machines are designed using high-grade components and progressive technology. We assure our patrons that our variety is quality assured on predefined limitations, in order to meet global norms. In addition, our prestigious patrons can buy these machines as per their requirements, at highly competitive rates. We are offering a high speed Chinese Fine Wire Drawing Machine that is used for drawing different wires of diverse lengths. Our Chinese Fine Wire Drawing Machine is user-friendly in operation and flawless in performance. Chinese Fine Wire Drawing Machine that we offer is also acknowledged for its sturdy construction and longer service life. Enriched with broad market competence and proficiency of this work area, we are offering an extensive gamut of RBD Wire Drawing Machine that can also be said as Indian RBD Wire Drawing Machine. Obtainable in various technical stipulations, our provided machine is specifically designed and developed under the supervision of trained personnel using optimum-grade raw material. Due to its maintenance free and optimal performance features, our provided machine is highly recognized amid our patrons.